Fannypack and I have been running for around 10 weeks now and somewhere along the lines, we decided that we needed a goal. So to have something to show for our 10 weeks of training, her and I registered for the 5K portion of the Night Race 2014! 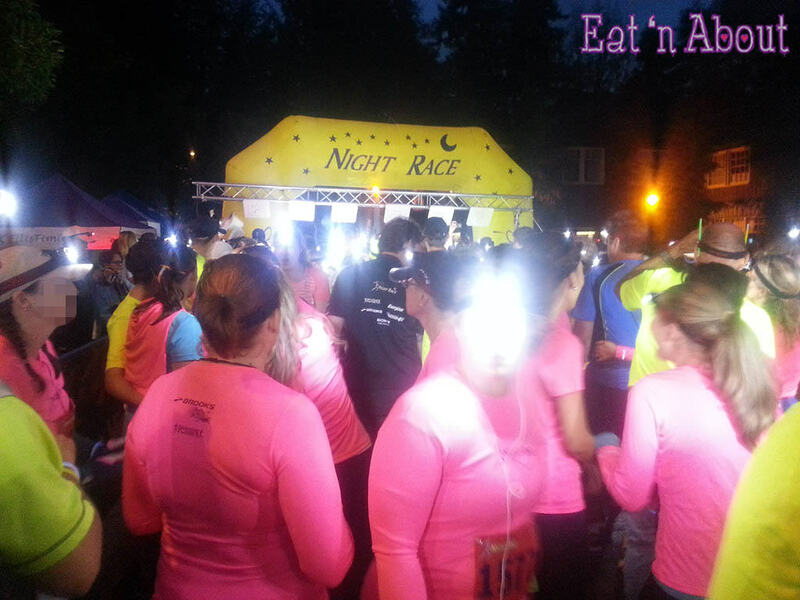 The race happened last Friday at Stanley Park with the starting and finish line at the Stanley Park Pavilion. There were lots of protein bars from Pure Protein to be had and water from Happy Water. There was also neon face painting and glow sticks handed out. 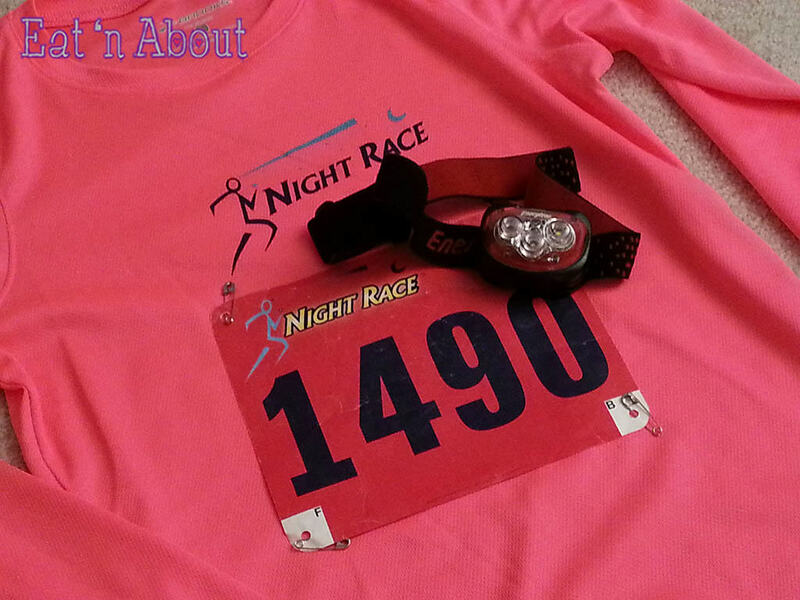 Everyone who registers get an Energizer headlamp and a bright Brooks tech tee- pink for girls, yellow for guys. I’m glad ours was a long sleeve because it was cold that night!!! We were lucky though, the torrential rain stopped when it got close to the event. Then it was the 5K starts. By then it was pretty dark, but with all our lights on, we were a sight to be seen. The MCs got everyone to jump up and down for video effect (they were taking videos too). Then it was time to start. We ran along the Stanley Park seawall….such a pretty sight at night overlooking downtown Vancouver. I must say, I’m really starting to appreciate the beauty of Vancouver after starting running. Fannypack and I ran the whole way, which was more of an accomplishment for me really (Fannypack actually runs 10-18K herself). I’ve never ran 5K straight before and this was my first time and mighty proud of it. The path to the finish line was killer though…uphill!! But Fannypack and I held hands, and sprinted to the finish together! Our time in the end was 32 minutes (actually, I somehow beat her by 1 second haha). It was a decent time, considering the first place finish was 19 minutes. It was super fun, and it was so great doing it with my bestie. We’re for sure going to do another race soon. Fannypack will make sure of that. 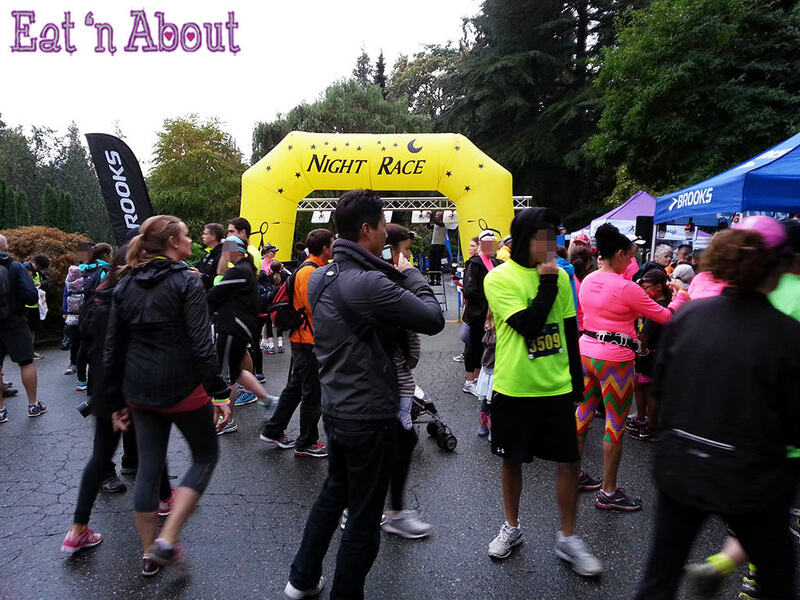 Previous PostXpocity Vancouver 2014 – A Girls Night Out! !